In the summer of 1956, a handful of men gathered in a former little red schoolhouse in San Diego. These men were among the most imaginative scientists and engineers of their generation. There was their leader, Frederic de Hoffmann who had worked on the Manhattan Project and was now the president of the company General Atomics. Hoffmann was not only a creative physicist but also an unusually shrewd and capable manager and entrepreneur; in the later years of his life he would take the celebrated Salk Institute to great heights. There was also Freeman Dyson, a remarkably versatile mathematical physicist from the Institute for Advanced Study in Princeton who had previously reconciled disparate theories of quantum electrodynamics – the strange theory of light and matter. And there was Edward Teller, another Manhattan Project veteran; a dark, volatile and brilliant physicist who would become so convinced of the power of nuclear weapons to save the world that he would inspire the caricature of the mad scientist in Stanley Kubrick’s classic film “Dr. Strangelove”. Together these men and their associates worked on a single goal: the creation of a nuclear reactor that was intrinsically safe, one that would cease and desist its nuclear transformations even in the face of human folly and stupidity. The reactor would have the rather uninspired name TRIGA (Training, Research, Isotopes, General Atomics) but its legacy would be anything but uninspiring. At the heart of the reactor’s success was not a technical innovation but an open atmosphere of debate and discussion. Every day someone – mostly Teller – would come up with ten ideas, most of which sounded crazy. The others – mostly Dyson – would then patiently work through the ideas, discarding several of them, extracting the gems from the dross and giving them rigorous shape. TRIGA benefited from a maximum of free inquiry and individual creativity and a minimum of bureaucratic interference. There was no overarching managerial body dictating the thoughts of the designers. Everyone was free to come up with any idea they thought of, and the job of the rest of the group was to either refine the idea and make it more rigorous and practical or discard it and move on to the next idea. The makers of TRIGA would have been right at home with the computer entrepreneurs of Silicon Valley a few decades later. At the core of TRIGA’s operation was a principle called the warm neutron principle. 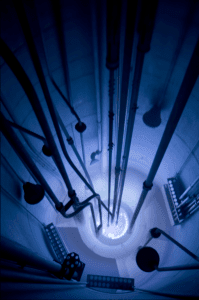 In a conventional reactor the neutrons in the fuel are moderated by hydrogen in the cooler water from the surroundings. There is a significant potential for a meltdown if someone pulls out the control rods, since the water which stays cool for a while will continue to moderate the neutrons and sustain their efficacy for causing fission. Dyson and Teller’s idea was to place half of the hydrogen in the water and the rest in the fuel in the form of a uranium and zirconium hydride alloy. This would result in only half of the hydrogen staying cool enough to moderate the neutrons, while the other half in the hydride stays warm and diminishes the ability of the neutrons to fission uranium. This results in the fuel having what is called a negative temperature coefficient. The fuel rods were fashioned with care and precision by Massoud Simnad, an Iranian metallurgist working on the project. The warm neutron principle is what made TRIGA intrinsically safe, very unlikely to sustain a meltdown or catastrophic failure. It took less than three years for the engineers and technicians to take the reactor from the design stage to manufacturing. The first TRIGA was inaugurated by none other than Niels Bohr in San Diego. Seventy of these safe reactors were built. They were safe and cheap enough to be operated in hospitals and universities by students and their main function was to produce isotopes for scientific and engineering experiments. They were also robust and safe enough to be proliferation resistant. As Dyson recounts in his elegant memoir“Disturbing the Universe”, the TRIGA is perhaps the only nuclear reactor that made a profit for its creator. March 28, 2019 - Bipartisan Senators Move to Cement Nuclear Power's Future POWER magazineA wide-ranging bill introduced by a group of U.S. senators seeks to cement the role advanced nuclear reactors will play in the nation's future power mix. April 8, 2019 - Future of nuclear energy in Pa. up for debate in Harrisburg WJAC JohnstownNuclear energy was a hot topic of conversation at the Capitol Monday. The House Consumer Affairs Committee held its first public hearing on House Bill 11. March 26, 2019 - Nuclear Energy Institute Seizes on Climate Momentum to Push for Policy Boost Greentech Media NewsThe nuclear industry's push for support comes days after the DOE announced $3.7 billion in loan support for Vogtle nuclear project in Georgia.